This post has been contributed by Don Enright, Volunteer and Past President with the Stanley Park Ecology Society (“SPES”). I have been following SPES since I moved into the West End almost a decade ago and I have been a member for two years. I wanted to offer the team an opportunity to share their news, events, and work so I have created “SPES Saturday” where they contribute and share stories with my audience once a month. Stanley Park’s Rose Garden is an ecological laboratory, and the experiment seems to be working. A wise man once said that art lies in the concealment of art. I’m pretty sure he was talking about painting, but he might have been describing the world of rose gardening. Take the Stanley Park Rose Garden, for example. 3000-odd plants fill a beautifully landscaped space in the heart of the park, and right now they are loaded—and I mean loaded—with buds. These plants are healthy, robust, burgeoning. They’re going to be spectacular. A work of art, in fact. But anybody who has ever grown a modern rose will tell you how very fussy they can be. You toil, you fuss, you prune, you spray, and at the end of it all you’ve got what looks like a bunch of soggy kleenex on a stick. It’s heartbreaking. So what’s the secret of Stanley Park’s healthy plants? Ecology, believe it or not. The Stanley Park Rose Garden is more than just a pretty place; it’s one of the most environmentally progressive rose gardens in Canada. The aptly-named Easy Going rose. Look at that foliage. Photo by Don Enright. Modern roses are the product of hundreds of years of cultivation. 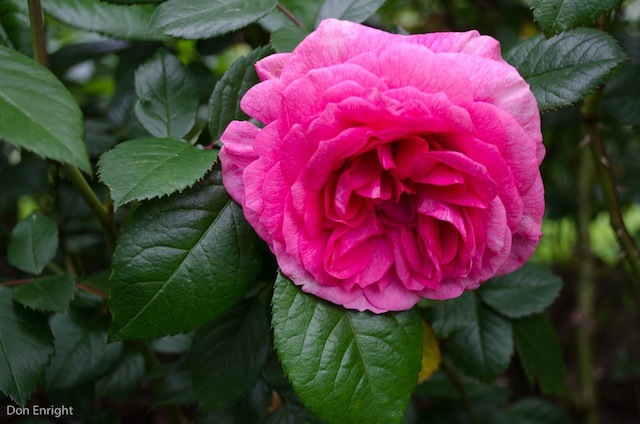 As far back as Roman times, people were selecting roses for their scent and beauty and cross-breeding them. Improving them, if you will. But to achieve the unparalleled beauty of the modern rose, some real sacrifices were made along the way. Disease resistance was the biggest: black-spot fungus and powdery mildew, in particular, are the modern rose’s nemeses. They show up as a powdery grey coating on the leaves, or hideous yellow and black spotting. Eventually the leaves just fall off. Vancouver’s moist climate, as you can imagine, is a fungal paradise, and by the mid-twentieth century, very few varieties could get through a season without being heavily and repeatedly sprayed. Sweetness is a multi-sensory delight with terrible disease resistance. Photo by Don Enright. 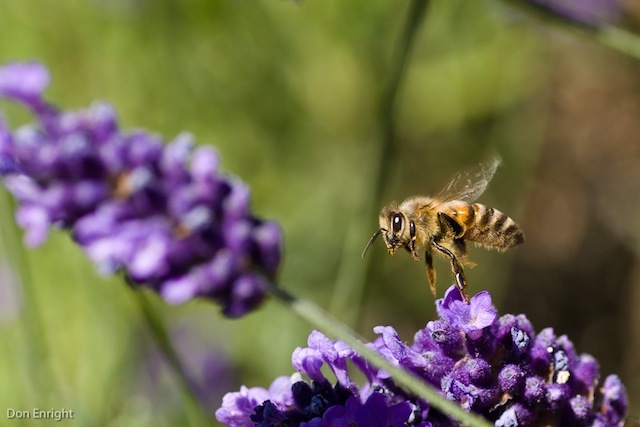 Fast-forward to a more enlightened age—one in which we see our honeybee populations crashing, among other alarming trends—and dowsing a cosmetic garden with chemicals just doesn’t cut it anymore. 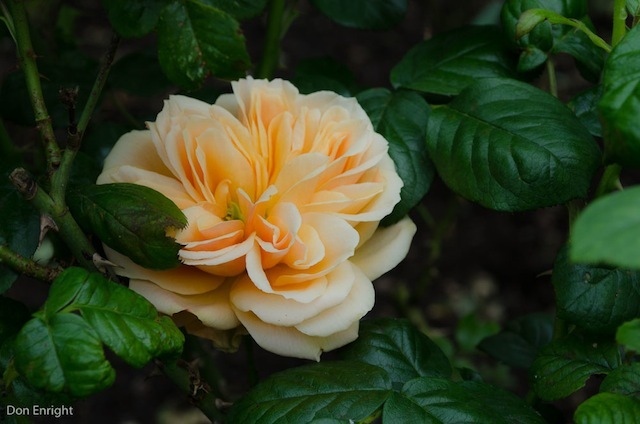 Environmentally-conscious gardeners around the world have begun to demand low-maintenance, no-spray roses, and rose breeders are stepping up to fill the gap. Our garden in the park is a showcase of the very latest in disease-resistant varieties. To breed a disease-resistant rose is a fairly simple exercise in Darwinism, really. Cross-pollinate your roses, throw the seeds in the ground, and simply choose the best of the survivors. No coddling, no spraying, no special treatment. Painstakingly repeat the process over many generations, and you’re in business. 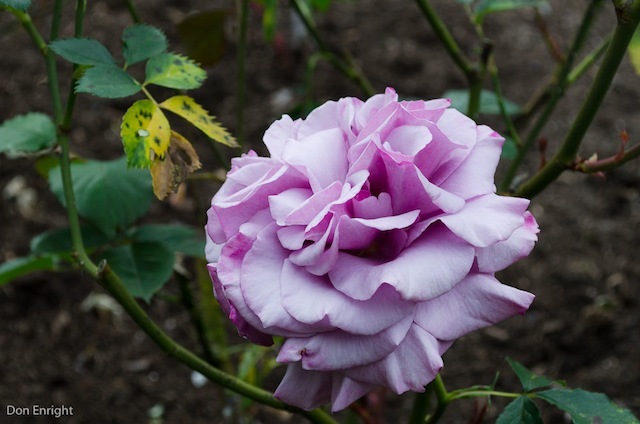 Kordes of Germany was one of the first of the big European houses to adopt a no-spray policy, and their roses—Eliza, Beverly, and the gorgeous Fairy Tale series—are among the finest in the Stanley Park collection. Other breeders are following suit—rumour has it even David Austin and his famous English roses are going organic. Zaide by Kordes. Photo by Don Enright. 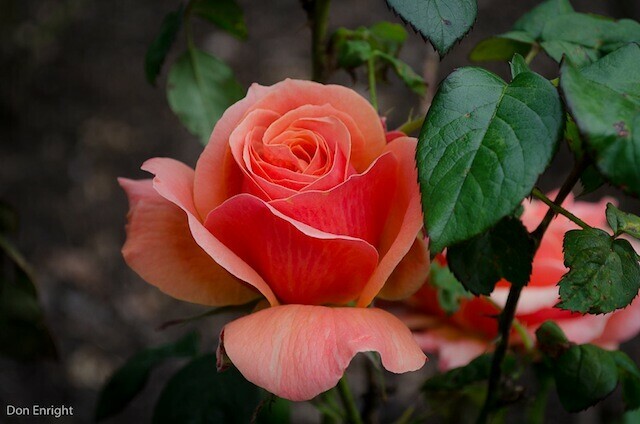 Of course it takes time and expertise to research, plan and pilot these cutting-edge roses, and Stanley Park gardening staff have teamed up with Langley’s own no-spray rose breeder, Brad Jalbert of Select Roses, to plan out the display. It’s a process of trial and error, because disease resistance can be a very regional phenomenon. There are at least a half-dozen different strains of black spot fungus across North America, and a rose that proves invincible to Ontario’s strains might fall apart in a single season here in Vancouver. Livin’ Easy rose. Photo by Don Enright. I have been visiting the garden regularly for a few years now. I enjoy watching tourists and locals alike take time to smell the flowers. And I really enjoy watching the honey bees and mason bees at work harvesting pollen (and the swallows harvesting the bees), knowing that they’re doing so in a pesticide-free park. 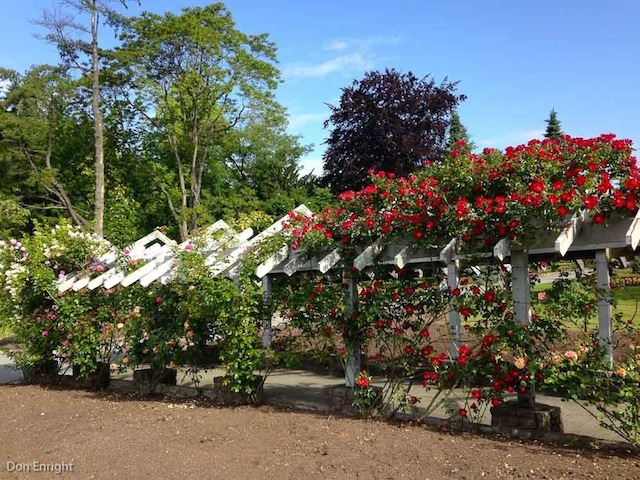 The garden dates back to 1920, when the Kiwanis Club established it to “demonstrate the possibilities of rose gardening in Vancouver.” It’s exciting to imagine what possibilities still lie ahead for the Stanley Park rose garden. Busy as a pesticide-free bee. Photo by Don Enright. This post has been contributed by Don Enright, Volunteer and Past President with the Stanley Park Ecology Society. If you want to support a non-profit organization that makes a difference for wildlife and people in Stanley Park, please make a donation or become a member of SPES. For more information visit the Stanley Park Ecology Society website. Follow SPES on Facebook and Twitter for the latest updates. I heard-my Uncle Matt McCormick worked in the Rose Gardens, when he reitred from his regular job. Got any data om that?